The story begins back in 2012 when our spiritual leader, Amnyi Trulchung Rinpoche pointed down Erin's driveway and said "I can see a Gompa there - we must build one" As Erin tells it she laughed as she thought he was joking. However when he visited the following year, looked her in the eye and asked "Where's my Gompa?" she realised he was not! Planning began in earnest between herself, Keith Rowan from the Nelson Buddhist Centre and Rinpoche to turn his vision into a reality. Although the project was very much driven by these key people and in particular by Erin's staunch tenacity, it was also a tremendous team effort with members of the Buddhist community, friends, relatives and neighbours all chipping in with generous donations of time and labour, enthusiasm and the all crucial gift of money. 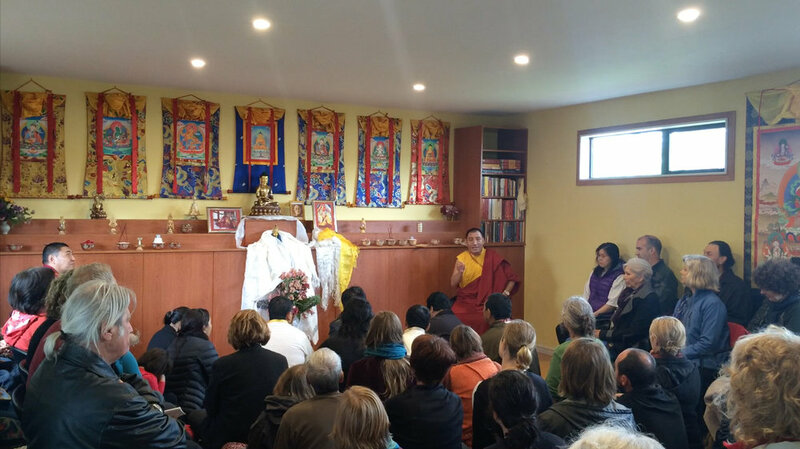 It was a memoriable day indeed in August 2015 when, a large group of members and supporters including the Tibetan community and members from various Buddhist groups in Christchurch gathered for the official opening of the Gompa by Amnyi Trulchung Rinpoche.